BRISTOL - Few teams have players who can do a little bit of everything. 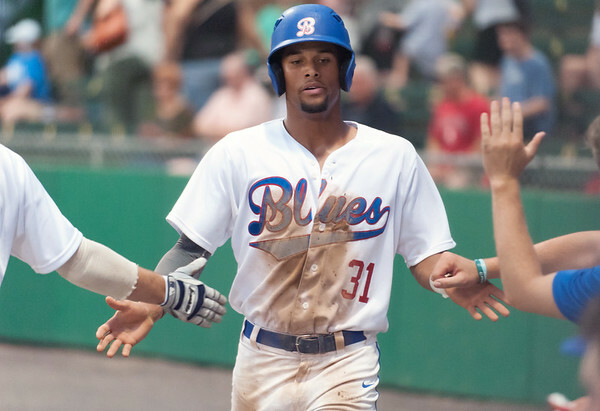 In Peyton Stephens, the Bristol Blues have exactly that. Stephens has been all over the field for the Blues this season - from the mound to the batter’s box to the outfield - making an impact for the team every step of the way. At the plate, the Waterbury native has continued the momentum from his hot freshman season at Central Connecticut State University. Though his average dipped from .301 as a Blue Devil to .256 with Bristol, Stephens has still found a way to produce runs. His 18 RBI are the third-most on the team. He also has more runs scored (20) and stolen bases (7) than he did at CCSU. Even with the struggles at time, Bristol manager Ronnie Palmer is as confident in Stephens as he is with anyone on the team. Stephens has even seen an offensive surge of late, with hits in eight of his last nine games entering Monday night’s playoff game against the Pittsfield Suns, with six RBI over that stretch. But Palmer doesn’t think his outfielder is doing anything differently. The biggest improvement to Stephens’ game has been his effectiveness on the mound. After Stephens struggled with an 8.64 ERA in just 8 1/3 innings for CCSU, he’s found his groove with the Blues. Although he hasn’t gotten many opportunities as a pitcher, he has taken advantage of it, proving he can be someone Palmer can rely on out of the bullpen in the playoffs. In five appearances this summer, Stephens has gone 6 2/3 innings, giving up just two runs and two hits. He also has 11 strikeouts, showing he can do much more than just hit. Perhaps one of the biggest keys to Stephens’ improvement on the mound has been his ability to get more practice time than he did during CCSU’s season. But overall, Stephens’ greatest asset is his defense. In 316 2/3 innings in the field, he has committed just one error. With 42 putouts and 12 assists, Palmer believes Stephens brings the entire package as a defender. His well-rounded play did not go unnoticed - he was selected to the Futures League All-Star game by the fan vote. Still with only has one collegiate season under his belt, there’s no telling just how good he can be. If anything, this summer is one Stephens won’t take for granted. Posted in The Bristol Press, Bristol Blues on Monday, 6 August 2018 20:56. Updated: Monday, 6 August 2018 20:59.